Features in the bark of deciduous trees are more visible in some plants than in others. I noticed the prominent Lenticels in the bark of one of our flowering cherries a few days ago and thought that would be a good word to dissect. Lenticel is from the Latin lenticella, a small window. ​Lenticels are not always as obvious as they are on cherry trees, but they are present in the bark of woody plants in general. Openings called stomata on the undersides of leaves allow and control the movement of oxygen, carbon dioxide and water into and out of leaves for photosynthesis and respiration. Generally speaking, woody stems do not photosynthesize but the live cells in woody stems do carry on respiration. That means that oxygen and water need to get into the stems and carbon dioxide and water need to get out. The bark acts as a protective layer that should prevent the flow of any liquid or gas in either direction. That would be fatal to the living cells in the outer layers of the stems. 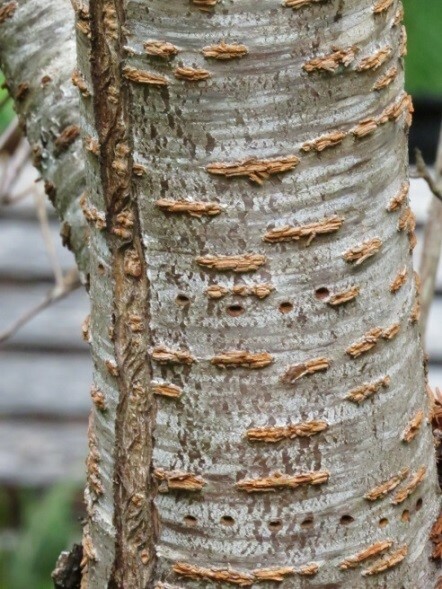 Woody plants have developed soft, spongy areas in the bark, Lenticels, that allow gases to pass through between living cells and the exterior, thus solving the problem. Rhododendrons have lenticels, but often they are not as obvious as those in cherries. It shows also the second meaning of the word lenticel, little lens. Most lenticels are lens shaped, though it isn’t always obvious. That may be why they were assigned that name originally. Lenticels are not confined to the bark of woody plants. Fruits such as apples and pears, tubers such as potatoes and storage roots such as carrots have living cells, so they require gas exchange with the environment and have lenticels. 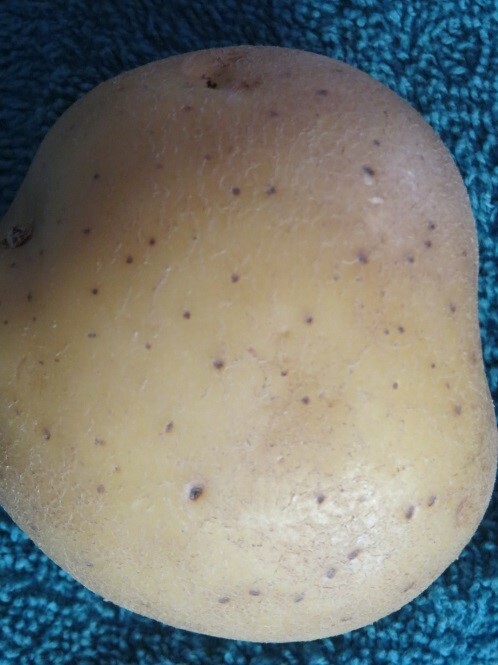 The lenticels on the potato in the center illustration are not clearly lens-shaped, but there is a row of seven of them at the bottom right of the photo that are. To carry on respiration in the stems of woody plants, a nice solution to the problem of needing to be nearly impervious to the outside environment while requiring gas exchange for the living cells has been solved by the presence of lenticels. Neat, effective solution!